When you hear "food art," you probably think of clever, creative arrangements of edibles on a plate. You definitely don't think of twenty-five acre works best viewed from a helicopter. Yet, in Shenyang, China, that's exactly what farmers are creating. The works comprise an untraditional theme park in the northeastern Liaoning Province. The theme park's name, Dao Meng Kong Jian, is a bit of a joke—literally translates to "Space of Rice Dreams." It’s also the name studios released Inception under in China. 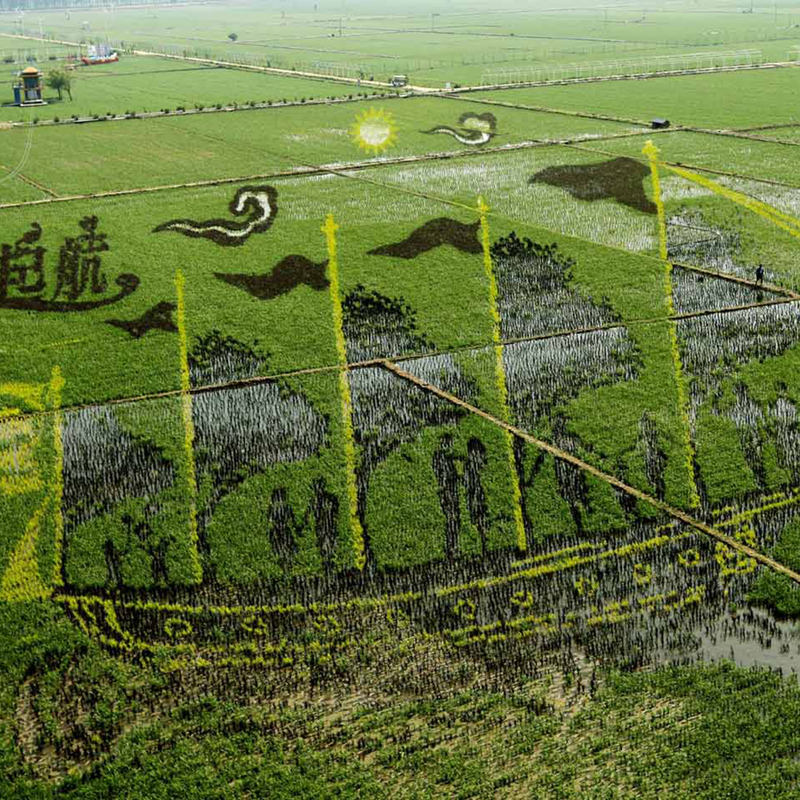 In addition to using different varieties of rice to achieve the many colors in these images, the farmers also carefully consider the height of the saplings they use, such that the images are rendered in breathtaking 3-D and take on new qualities as you view them from different angles. To keep people coming to the theme park, farmers roll out new designs every year. They range from traditional Chinese folk art illustrations that could just as easily hang on scrolls in museums, full of ships, wispy clouds, waves, fields and flowers, to cultural icons. This year's cultural icon field portrays Marilyn Monroe with her skirt blowing up. Other rice paddy art locales have displayed Napoleon riding his horse and anime superstar Naruto.